Citation Information: J Clin Invest. 2003;112(4):460-467. https://doi.org/10.1172/JCI19523. Sepsis remains a serious cause of morbidity and mortality, and the pathophysiology of the disease is not clear. The definition of the clinical manifestations of sepsis is ever evolving. This review discusses the search for effective therapeutic interventions, hurdles in translational sepsis research, and new therapies in development in current clinical trials. Possible reasons for failure in sepsis trials. The flow diagram reflects various stages in the development of sepsis therapies that precede clinical trials in sepsis patients. At each stage, possible reasons for failure of the strategy are listed. 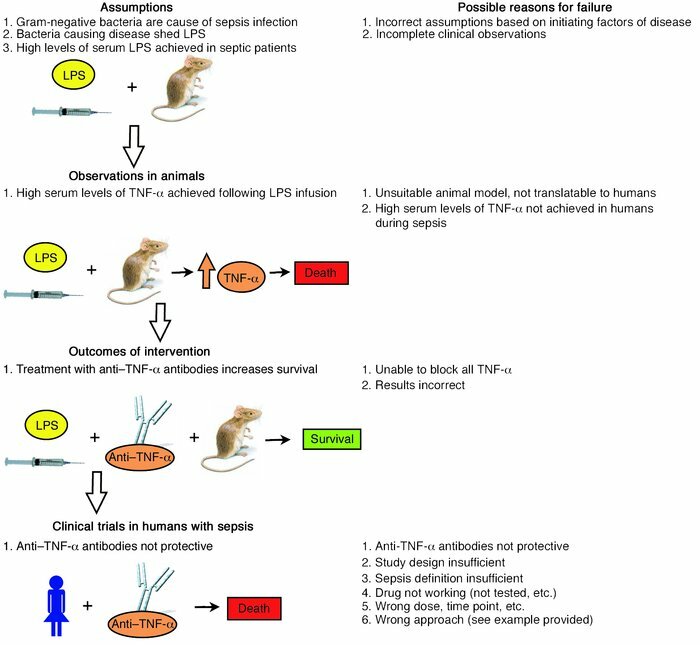 The murine LPS infusion model illustrates that anti–TNF-α antibody treatment can successfully increase survival rates of septic animals; however, this same therapy proved unsuccessful in clinical trials in humans with sepsis.